Preheat your oven to 375. In a large pan, brown the sausage, breaking it into small pieces. Once brown, transfer to a very large bowl. In the same pan, add butter. Once the butter is melted, add the celery and onion and cook 5-8 minutes on medium until it is softened. 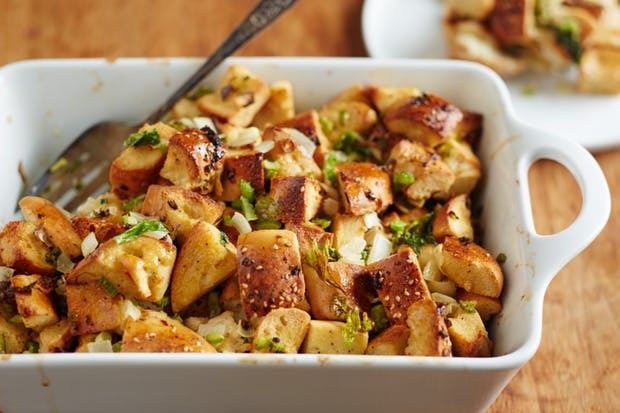 Add to bowl along with the stuffing mix. Once it is blended, start adding the stock until the stuffing is a little sticky but not soggy. I usually add at least 4-6 cups. Add more seasoning if needed. Transfer it to a large buttered casserole dish and cover with foil. Bake at least 40 minutes with foil on then take off foil and bake another 20 minutes. Make sure it is crispy on the outside, but moist on the inside. As a vegetarian at Thanksgiving, everyone is concerned about what they will replace the turkey with for my family! But really, I have never missed it because the sides are key! 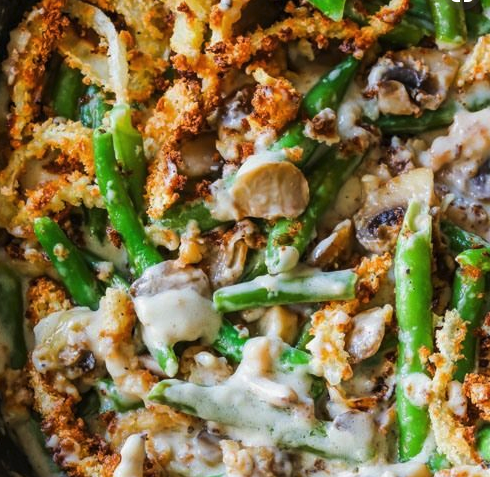 One of my favorites is the Green Bean Casserole. Not the version made from a can, instead this version made with fresh ingredients all from scratch. I came across this recipe years ago and have adopted it into our Thanksgiving feast every since. Preheat the oven to 475 degrees F. Combine the onions, flour, Panko and salt in a large mixing bowl and toss to combine. Evenly spread the onions on the baking pan and sprinkle with olive oil. Place the pan on the middle rack of the oven and bake until golden brown, approximately 30 minutes. Toss the onions every 10 minutes during cooking. Once done, remove from the oven and set aside until ready to use. Turn the oven down to 400 degrees F. While the onions are cooking, prepare the beans. Bring a gallon of water and 2 tablespoons of salt to a boil in an 8-quart saucepan. Add the beans and blanch for 5 minutes. Drain in a colander and immediately plunge the beans into a large bowl of ice water to stop the cooking. Drain and set aside. Remove from the heat and stir in 1/2 of the onions and all of the green beans. Top with the remaining onions. Place into the oven and bake until bubbly, approximately 15 minutes. Remove and serve immediately. We’ve always done the traditional Sweet Potato Casserole in my family but a few years ago, I introduced an iteration on the casserole by serving these Sweet Potato Bites instead. I love making them because they’re easy, fun and the taste still brings back all the memories of our past family Thanksgivings! Preheat oven to 400 degrees F. Slice sweet potatoes into 1/4” coins. Toss with melted butter and maple syrup and place in an even layer on a baking sheet. Sprinkle each coin with salt. Bake for about 20 minutes, or until tender, flipping the sweet potatoes halfway through. Remove baking sheet from oven and turn on the broiler. Top each cooked sweet potato round with a marshmallow. Place under broiler and broil until the marshmallow is puffed and golden. 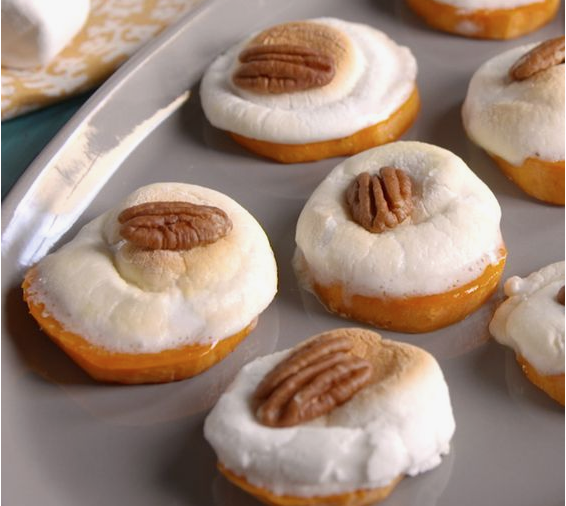 Remove from oven immediately and top each marshmallow with a pecan half. 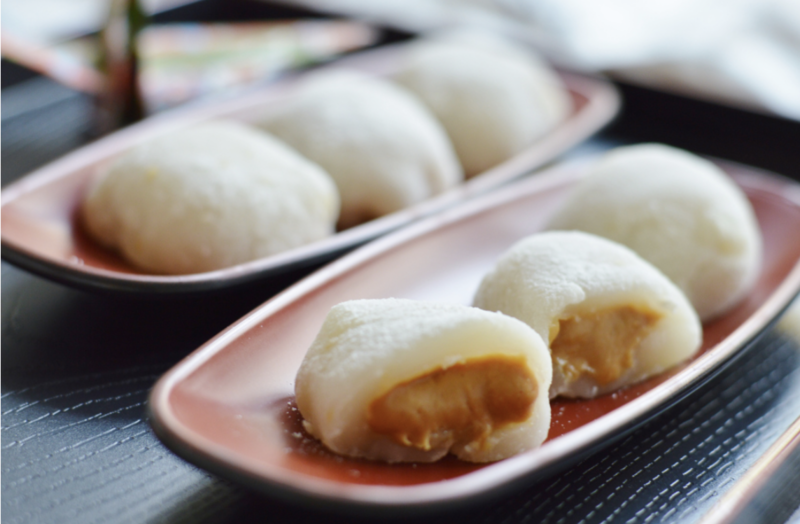 This peanut butter filled mochi is one of my favorite desserts to make and is filled with so many fun memories. Mochi is a traditional Japanese food typically made for the new year, but my Grandma would make it for me year round because I loved it so much! Anytime I visited her in Molokai we would make huge batches of it for all our friends and family. This recipe easily became my go-to for any holiday get together because it is such a hit with everyone, even if they have never had mochi before. The addition of peanut butter and butterfingers is a fun new spin on a traditional recipe. Crush Butterfingers and mix into peanut butter. Mix Mochiko flour, water and sugar until well blended. Take a 9-inch glass pie pan and spray with non-stick spray. Pour mixture into pie pan and cover with plastic wrap. Cook in microwave for 6-7 minutes. Remove and let cool. Place mochiko flour on clean flat surface and take mochi out of the pan. Take 2 inch pieces and roll into balls. Fill with peanut butter mixture and press the edges together.